Midnight loves to groom my fingers. A benefit of fingerless gloves. I had always heard stores sent things to bloggers for free to review but didn’t expect it to happen to me. Sure, I’ve had a few people offer to send me something but with the caveat I had to pay shipping. Honestly the price of the shipping was so high that I thought if I did do it, the shipping paid for the object. In other words, not free. So when Literary Book Gifts contacted me to review their writing gloves, I was a tad skeptical. However, they were true to their word and set me up to receive the gloves for free to be reviewed. I like the writing gloves. They are comfy and I wish I had them a couple of months ago when I was visiting California. Do you know they have snow in the mountains? Shocker, I know. My hands would get really cold at night typing away and this would have been perfect. They are fingerless so you still have good dexterity to type but your palms and wrists stay warm. The other thing I like as a cat person is I can pet my cat and still feel the fur with my fingers while keeping the rest of my hand warm. These gloves are perfect for the cold seasons. Midnight likes that he can still lick my fingers. He likes grooming me. 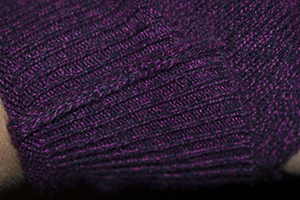 When asked to pick a color, I chose the purple heather color which is a deep violet flecked with black. Very cool color combo. Flipped the bottom edge over so you can see the knit gloves seam. I love a clean, tight seam. I looked at the seams and the edges and the craftsmanship looked pretty good. There was only one seam on each glove along the thumb side and it laid flat and tight, no loose ends flopping around. The knit is a tight weave with ridging along the top and bottom which looks good. The thickness is thicker than a jersey knit, about the thickness of a thin sweater knit. I can’t really comment on the price because you know me, I’m a bargain hunter who haunts thrift stores. My friend pays hundreds of dollars for a purse. She’s a handbag collector but she shops differently than I do. My best handbags came from a thrift store that sold them for $1.49 a pound. I found a designer purse with seashells cut into squares, handsewn to totally cover the handbag, their shiny abalone rainbow colors catching the light, for around $2 which when I looked it up, retailed for more than $500 by that designer. Was the purse worth $500? I could tell a lot of work went into it and obviously some people thought the designer brand was worth the money. The one I found was a little dirty but I was okay with that. The people who paid full price wanted something brand new, pristine and in perfect condition. So price really depends on how you shop, whether you go to designer retail shops or garage sales and everything in between. While I like the gloves, I do have one beef. the website says it is about 35% cashmere wool blended with cotton, polyester and microfibers “for durability” but the gloves arrived with no fabric information, nor any care instructions. You are eventually going to have to wash them and it would be good to know how. Because I’m into textiles, I think exact fabric information and fabric care should always be included. However, it could be because I received a “free journalist copy” that it isn’t packaged the same way as it would be for a paying customer. Interestingly, the contact information for the manufacturer Sparsil was included with the gloves but not the retailer Literary Book Gifts contact info or social networks. Of course, I already had the Literary Book Gifts contact info because they emailed me when they first asked me to review the gloves but it is something you want in every package. If you want your customer to return to you, I think a little card from your own company would be a good thing. The thing about the gloves is that I didn’t know I needed them until I got them. I always found gloves useless for typing as they make my fingers fatter so I hit the wrong letters all the time. In regular gloves, my typos become epic. So if my hands were cold, I either toughed it out or wrapped it around a cup of hot coffee to warm them up before going back to typing. 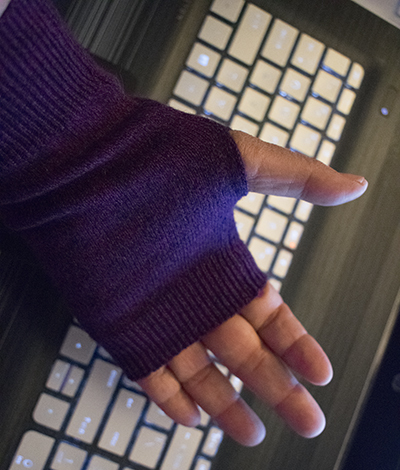 Now I can wear these fingerless gloves in winter to warm my freezing hands when I stay up late typing. These will be perfect then. Since this is my first review, let me know what you think, not only of the item but about the review or photos. Is there information you think I should have included? Or is there information that you felt was unnecessary? Does the review give you a fair representation of the gloves? 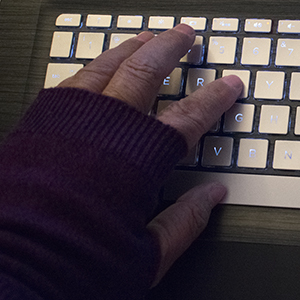 Out of curiousity, do you already wear fingerless gloves or gloves while typing when your hands are cold? How’s that working out? what color? 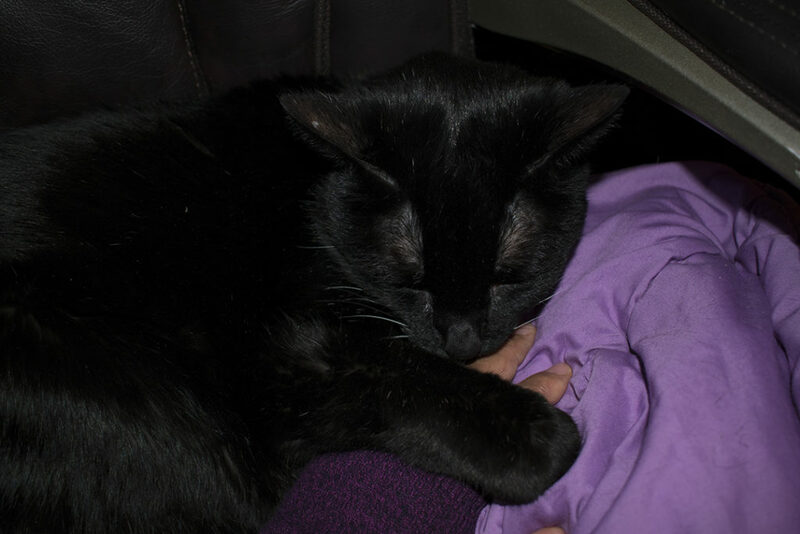 Midnight falls asleep on my hand. Now how am I supposed to type? I hate waking him up but I could be stuck here for hours! A fine help he turned out to be! Yay, thank you. I was worried about it. I was happy that Midnight agreed to help me out with it. I’ve always heard of purple heather in romance novels but have never seen it. I heard it’s beautiful. I bet you have a lot of local knitters where you are because I heard the wool up there is wonderful. Hey there 🙂 As always, I’m loving the photos of Midnight. He is such a cutie pie! ♥ Certainly does look as though he’s quite a helper in the last photo, hah! He loves his mama dearly! Warms my heart to see! These gloves are pretty neat. I hadn’t thought of such an idea for writers, how about that! The fabric looks as though it would be comfortable and not scratchy? What do you think? I bought a pair of “technology gloves” for my husband one time. Those enable you to keep your gloves on and still operate the touch screen on your cell phone. Where he works outside often, I didn’t want him to get cold just to use his mobile. To answer your questions – I thought you did very well with the review. You showcased the gloves well in the photos, photographing each side and the well-crafted seams. To me, reviews come in all shapes and sizes. But honest is the main feature one should have. Just selling something to someone is not very admirable if you wouldn’t want it yourself. You were honest and I appreciate that. You stated the good and the could be improved aspects which was perfect. I say bravo 🙂 Here’s to lots of sales and more reviews to come ♥ I sincerely wish you all the very best of success and enjoyment! thank you for the great feedback. I really appreciate it. Your reply was very thoughtful and helped me to see what I did right. Any sales they make is their own profit as they don’t aren’t an affiliate site but I think for bloggers knowing how to write a review is a good skill to have. I did get the gloves for free so I thought that was cool. I still wonder how they found me as I have a small blog. I heard freebies happen a lot to people who do Amazon reviews. I’ve never heard of technology gloves but that sounded cool so I looked them up. I bet your husband was happy not to have to take his glvoes off to use his phone. thanks again for your thoughtful and great feedback. Well those are pretty nice and Midnight sure likes them. Great reviw too, ya done good! thank you for the feedback. I’m glad the review was good. Midnight waves at your kitties. I think you did a great job with the review…fit, colors, price, usefulness…you hit on all the topics. Yay! thank you for the feedback! It’s invaluable and reassuring. I’ve never used these kinds of gloves, but I hate having cold hands. Great review. I had to chuckle with Midnight on your hand. We never want to disturb them. I wake up sometimes with Pinkie sleeping next to me. she waits until I fall asleep to move next to me. I hate to wake her but sometimes you just have to get out of bed to go you know. I hope you had a great Easter Sunday and weekend! At least Midnight likes the gloves 🙂 I wear fingerless gloves when writing in the winter — they were a gift years ago (hand-knitted) in a nice tan-coffee colour. Good review! I know one of the co-hosts for the A-Z is doing an A-Z about reviews that you might find helpful. I read it twice although I didn’t really want to read it once–mainly because the item is of no interest to me. Maybe it is because I am a man. I would rather have my hands freeze and drop off than wear purple gloves with no fingers. That said, I think you covered all the bases, Mary. The washing instructions are important to some, but no matter what they are, eventually I will forget and toss them into the washing machine and/or dryer regardless! Then we will see what the quality really is!!! laughing at the image of a tough writer freezing until his finger falls off. so is it the color or the no fingers? Is black ok for guys? I never thought about guys not liking it because it was too girly — was thinking of it as a comfort thing. I do appreciate it your reading through it twice (the horror!) and giving me your feedback. I do agree that a lot of people do that — just throw it in the washer but it would be good to know if it’s supposed to be handwashed or washing machine. some people won’t buy things that need to be handwashed. I’ve seen reviews where people give reviews on the opening of the package and then the photo after a few washes — some t-shirts with cool designs fade really fast. thanks again. The whole package is “unappealing”. Nuf said! Midnight is such a cutie. Those look like great gloves. Nice review. Midnight purrs thank you! They are cool gloves but from what I’ve seen on your blog, you’re pretty good at knitting too. Thank you for the feedback. I have fingerless gloves. They are leather. So if you punch somebody in the face, you don’t cut your knuckles on their teeth. At least thats what my mom said, Fair review of these… Eskimo typing gloves. Some people have no heat in their house, or they like to type in the park down by the skating rink. There is indeed a niche market for such stuff!